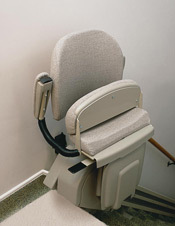 The Step saver stair lift is an older model that is no longer available from Savaria. It has been replaced by an updated model, the SL-1000. 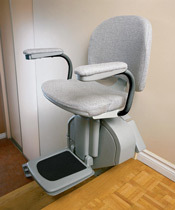 The Step Saver Straight Stairlift, manufactured by Savaria / Concord Elevator in Brampton, Ontario, features a battery powered rack and pinion drive system for years of quiet and reliable performance even during power outages. The Step Saver's narrow rail and folding seat features minimize the amount of space required on the stairway and it's neutral colour allow it to blend in with almost any decor. Speed - 20 fpm (0.1 m/s) approx.